South Africa is endowed with abundant renewable resources in the form of biomass, solar and wind energy. The Government’s White Paper on Renewable Energy Policy, released in 2003, supports the development of alternative energy systems with an ambitious target of generating 10,000 GWh green electricity by 2013. The introduction of Renewable Energy Feed-in-Tariff (REFIT) has generated good interest among Independent Power Producers (IPPs) to develop renewable energy projects in South Africa. According to conservative estimates, South Africa produces about 18 million tonnes of agricultural and forestry residues every year. The South African biofuels target for 2008?2013, according to Industrial Biofuels Strategy (2007), has been fixed at 2% penetration level in the national liquid fuel supply, which corresponds to 400 million litres per annum. When considering the use of 50?70% of this plant biomass with second generation biochemical and thermochemical technologies, South Africa has the potential to substitute the bulk of its current liquid fossil fuel usage (currently 21.2 BL/annum) with renewable biofuels. However, the only real activity has been US$437 million investment by the South Africa’s Industrial Development Corporation (IDC) and Energy Development Corporation (EDC) in two biofuels projects that will collectively produce 190 million litres of bioethanol from sugarcane and sugarbeet. Another important biomass energy sector is biogas-from-waste which can potentially generate more than 200 MW of electricity countrywide. There are several big projects in construction and operational phases in different parts of the country. 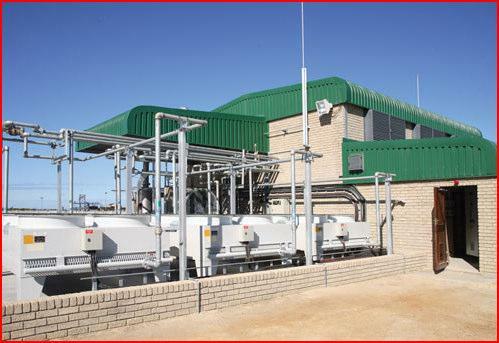 CAE Energy in partnership with Humphries Boerdery, has developed 1.2MW biogas power project near Bela-Bela, Limpopo province, with the plant having produced 10 MWh of electricity since August 2009. Independent power producer Lesedi Biogas Project is planning to build one of the world’s largest open-air feedlot manure-to-power plants, in Heidelberg, near Johannesburg with capital cost of US$ 15 million. The plant will be situated at the Karan Beef feedlot, which will supply 110,000 tons of manure annually to facilitate the generation of 3.8MW power, in addition to production of organic fertilizer and generation of carbon credits. We are busy building a biogas plant in South Africa where we use only waste produced at an abattoir. We are busy rolling out this technology at other abattoirs aswell. The first plant was financed by the IDC of SA. More you can get directly from me or on our website.